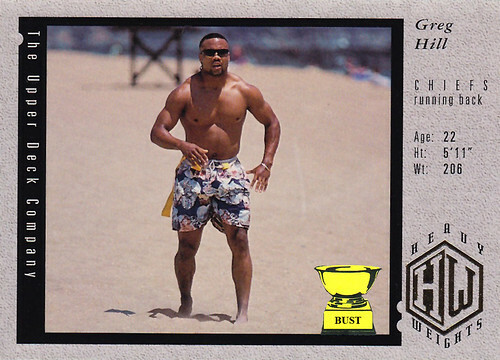 Greg Hill's train of thought from 12:20 to 12:22 p.m., June 25, 1994: "Hey, where'd they go? My teammates were right here just a minute ago, but now they're gone! I hope they didn't drown! Dang it, I never should have run to the bathroom to reshave my chest. And legs. Now they're probably dead, all because I wasn't here to save them. I can't believe this! Coach Schottenheimer's gonna kill me. Hey, what's this note here in the sand? Maybe they've been kidnapped, and this is the ransom note! 'Dear Greg. Have fun walking back to Kansas City. Get bent. Sincerely, Steve Bono.' Oh no, not again!"